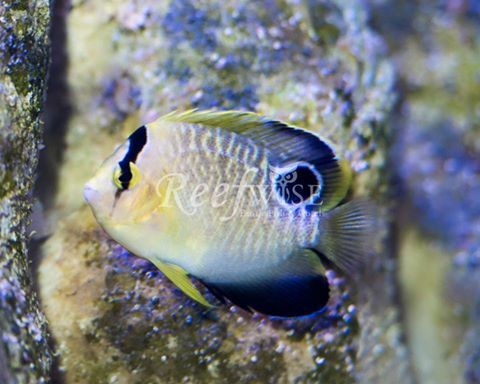 Home / Fish / Is This Weird Specimen A “Griffisflake” Hybrid Angelfish? 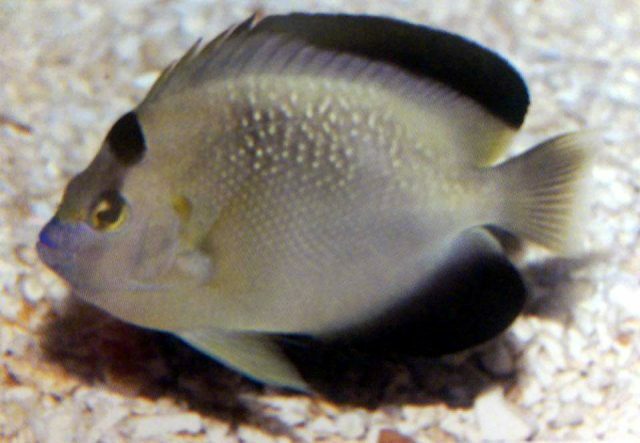 The above fish was collected at around 120 feet in Kiritimati (AKA Christmas Island) on the eastern edge of Polynesia and was suggested to be a hybrid of the only two species of Apolemichthys present in this region: the Goldflake Angelfish (A. xanthopunctatus) and Griffis’ Angelfish (A. griffisi). But is it? There are some unusual traits present in this specimen. The colors of this fish are definitely a bit washed out and less-vibrant when compared to the typical yellow of a Goldflake, which could certainly argue for there being some of the black & white Griffis’ DNA, but it’s also true that A. xanthopunctatus is a variable fish, with some being nearly brown and others quite yellow. 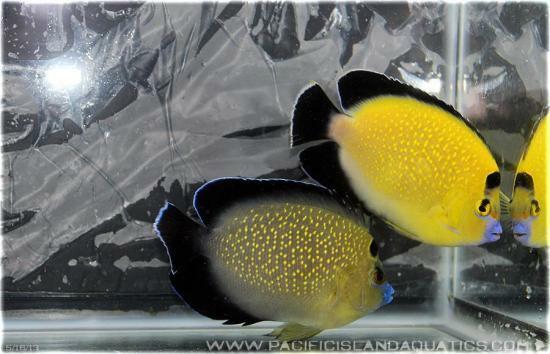 This has given rise to the spurious notion that there are wild hybrids of the Goldflake with the bright-yellow Flagfin Angelfish A. trimaculatus, but since such specimens are usually acquired from Kiritimati—far removed from the nearest population of the latter species—this is easily refuted (though it’s likely the two do hybridize along the western edges of the Pacific Plate). This specimen is also lacking the blue lips which normally would have developed in a Goldflake of this size—A. griffisi has a mostly grey face, with only a slight hint of blue present. 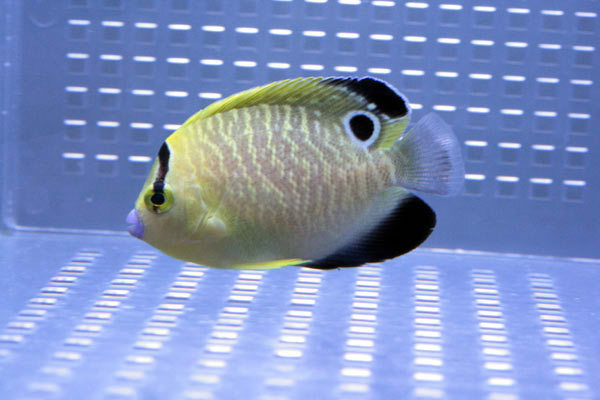 Does this support this being a hybrid, or might this just be an instance of a developmental abnormality (smaller Goldflakes also lack blue lips) or intraspecific variation? The same might be asked of the caudal fin, which would normally have started to turn solid black in a Goldflake, but here we see a mostly clear fin with hints of black infuscation, again reminiscent of A. griffisi. 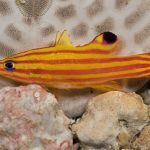 The collector, who has been diving the reefs of Kiritimati for many years, was said to be quite confident that this was a hybrid, which, if nothing else, emphasizes that this specimen is a bit out of the ordinary. But, is it a hybrid? My gut tells me no on this one. 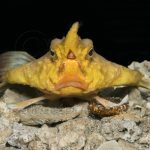 While this individual may be a bit off, it’s not terribly out of keeping with the normal developmental changes and intraspecific variations seen in A. xanthopunctatus, but it’s always possible that this could change as it matures. 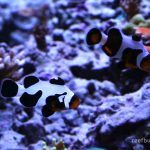 Fortunately, this fish was acquired by a local customer here in Chicago and we’ll hopefully be seeing updates in the future. 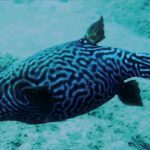 While pondering this peculiar piscine with Brian from Reefwise, a photograph of another remarkable specimen was shared, which had been procured from the same collector in Kiritimati around 5 years ago and sent to a retailer in Asia. This aberrant individual, with its muddy mix of colors along the side, seems more like what we might expect from a true hybrid of these two species. Looking closely, a faint trace of the Griffis’ white diagonal marking can just be made out here, further supporting this notion. An adult specimen purported to be this same hybrid mix (maybe even the same specimen?) 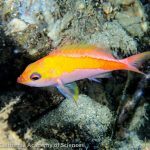 is in the possession of an aquarist in Asia and looks quite like this juvenile, having an unkempt mix of yellow and grey along the sides and a dusky yellow caudal fin. 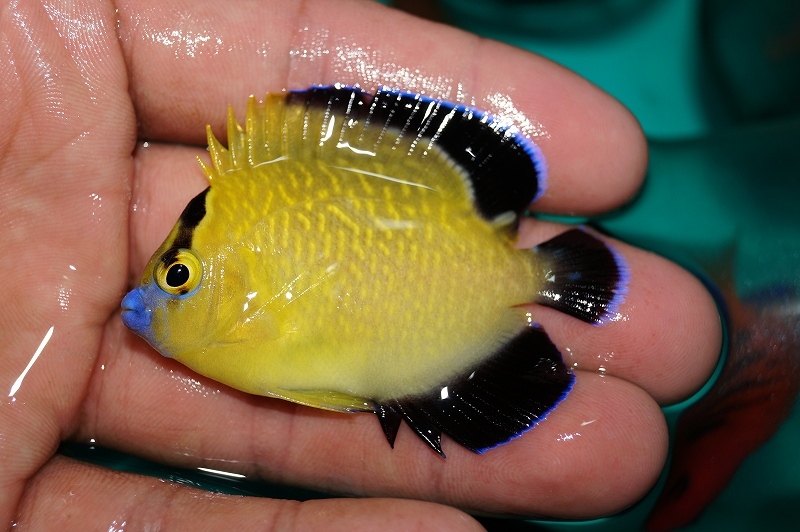 While DNA would certainly be necessary to fully prove the parentage here, it does seem like “Griffisflake Angelfish” is a real phenomenon.